This condo is in Sherwood Forest. 20 minutes to downtown Brevard. It is also an hour from south-west of downtown Asheville, an hour to Asheville Regional airport. 45 minute drive to Greenville, South Carolina. 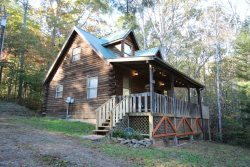 Commune with nature in Creek Side Condo, a cozy newly remodeled home embraced by the woods of Sherwood Forest, a 1000 acre Audubon Sanctuary. Perfect for a couple’s soothing retreat from a busy life. Get away from it all and find relaxation with the sounds of a babbling brook located beside the open deck with views of the golf course. You will find peace on the screened porch with plenty of fresh mountain air to enjoy. Explore the area from the numerous trails throughout the forest and possibly discover a few of the 1000 waterfalls of Transylvania County or one of the old abandoned stills in the area. Take advantage of the communities heated junior sized Olympic pool, tennis courts, or play a round of golf on the executive golf course. In just 15 minutes you can find yourself in the “Heart of Brevard” a charming small town with lots to offer with art galleries, many fine eateries and loads of activities for the whole family to enjoy! You may even catch sight of one of the elusive white squirrels. Come enjoy a vacation at Creek Side Condo!